Hello lovely visitors and welcome! 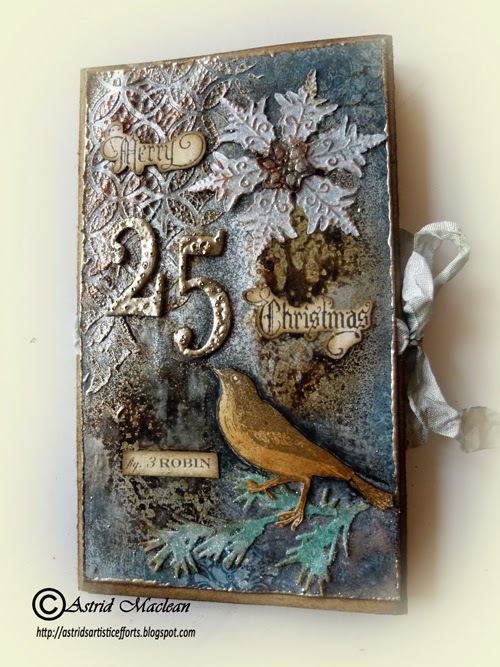 Get out your inks, paints, chalks, Gelatos etc and grab your bird dies, stencils, masks, stamps, whatever avian stash you have and conjure up something that sings of our feathered friends. Whatever you create, we want to see Tim's influence clearly identified. Let's see your magic! With it being the end of November and the dreaded C word (really I LOVE Christmas), coming ever closer, my project turned into a Christmas gift for one of my crafty friends. 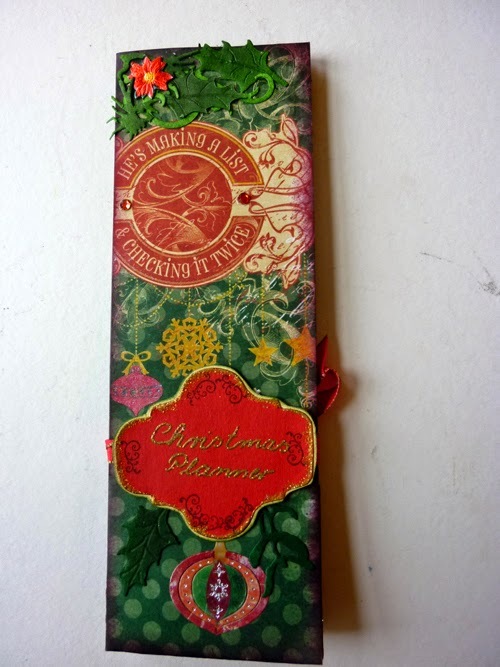 It's big enough to hold a size 8 tag inside and there is also a place for a special Christmas message. Below is a quick step by step with a lot of photos. 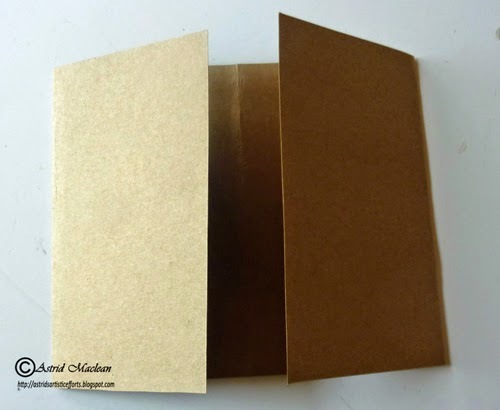 1.You need to start with a piece of A3 card, I am lucky enough to have Kraft card in that size, so used that as my substrate as it is so strong. But any card would do. Cut it to 7" (18cm) by 16.5" (41.5 cm). 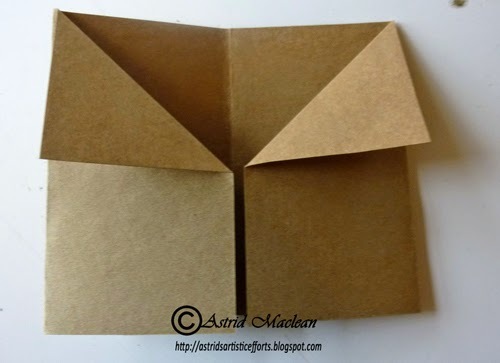 Fold it in half length wise and then fold each side to close to the middle, gatefold style. 2. 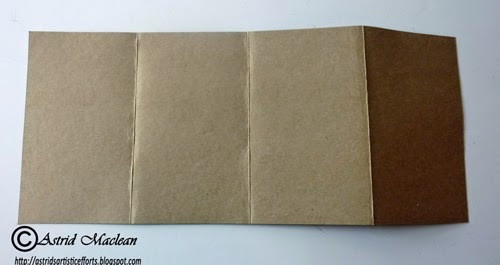 Open it out again and then fold the corner of each side down, like you can see in the photo below. This is the inside view and as you can see, you have created two pockets once you glue the sides, the bottom and corners down, but don't do this yet! 3. 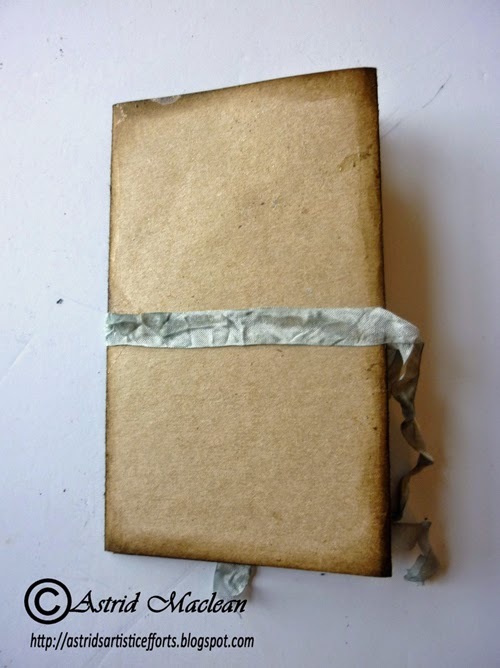 For the outside, glue on a ribbon, this will make it possible to close your booklet/folder later. I chose two different kinds of paper, cut to about a quarter inch smaller than your out and insides. Corner flaps: 1 time 3.5 by 3.5" (9 by 9 cm) cut diagonally and then trimmed to fit properly. 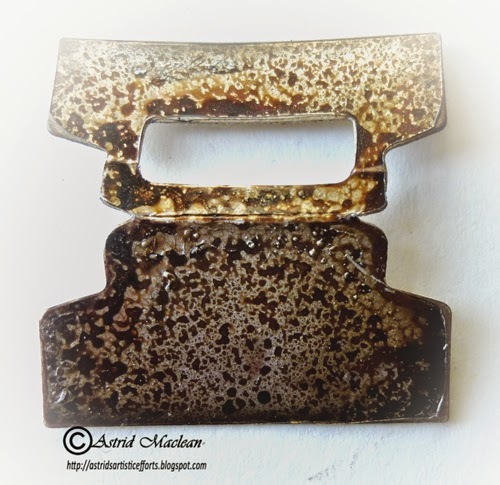 Two colours of Distress Sprays: Brushed Pewter and Walnut Stain. 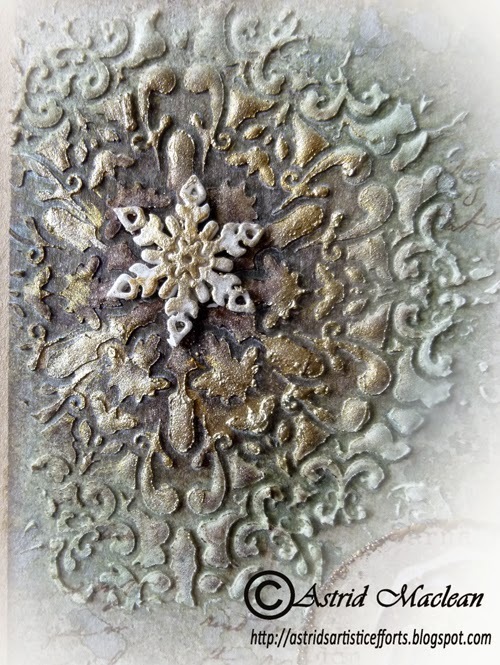 Embossing around the edges of the paper for a special finish. 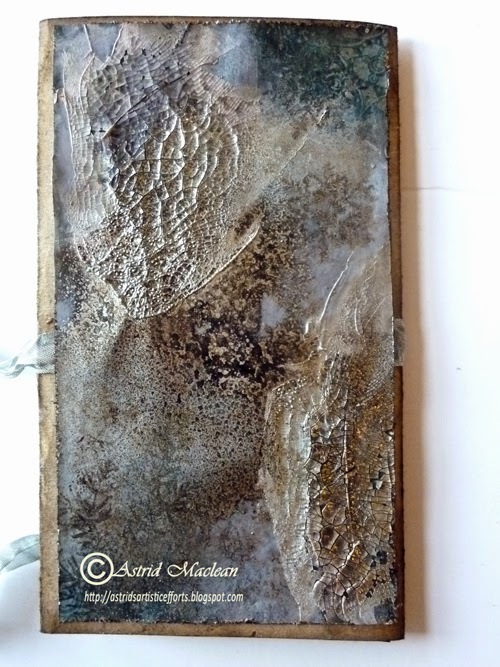 I used Stampendous Aged Silver. The back cover was done in a similar way, but instead of using a stencil, I just scraped on the crackle paste randomly with a palette knife. 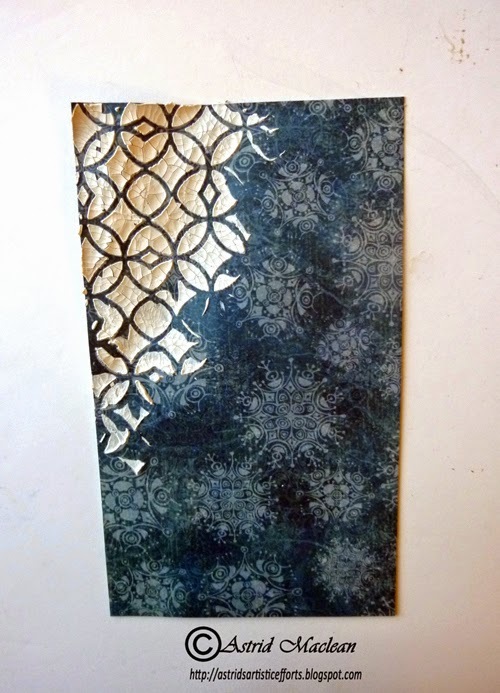 To alter the insides I just used inks as most of them would be covered by the flaps anyway. The flaps themselves were done in the same way as the outsides. 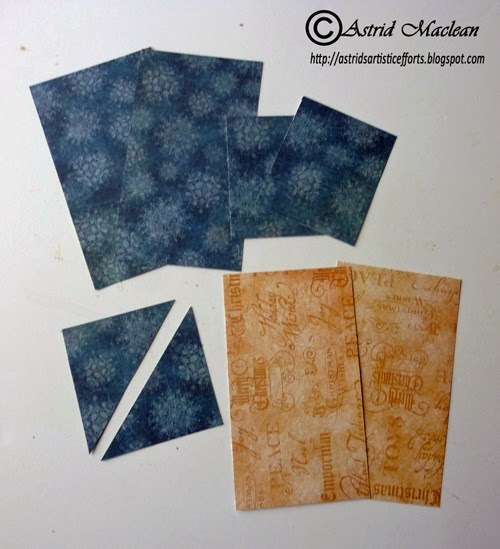 Now it is time to adhere your altered papers to your base card and to glue the flaps down to create the pockets. 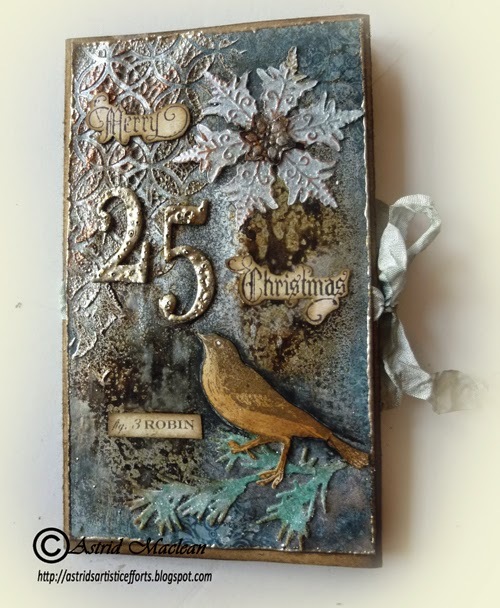 The 25 was given a metal look with the help of the same embossing powder. 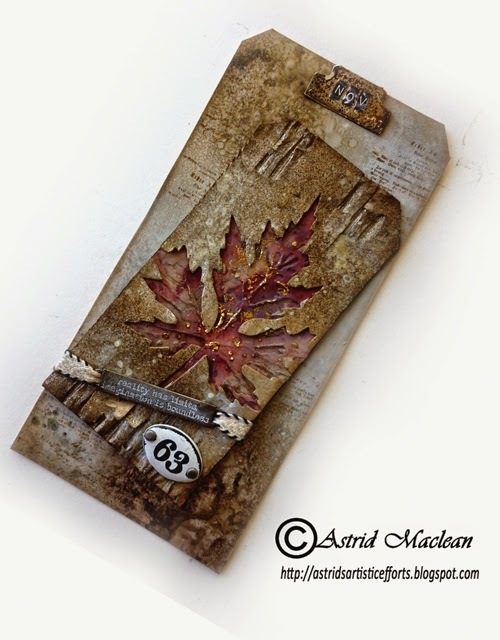 The bird is an Artistic Outpost stamp coloured with Distress Inks. The inside, after I glued down the sides. 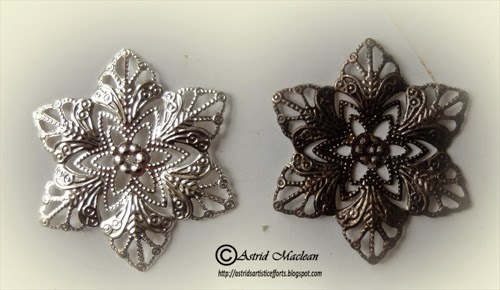 The embellishment on the left, was bright silver to start with. 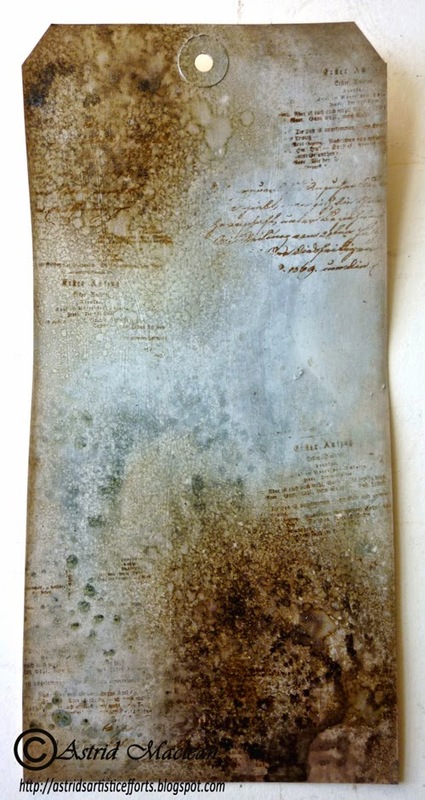 A quick spray with Walnut Spray ink turned it all aged looking. 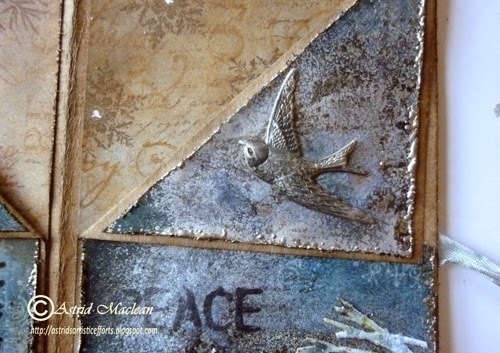 Another little bird, one of Tim's ideaology pieces. Finally I chose one of the tags made for a previous project to fit inside as it fitted perfectly. Thank you for visiting like always and have a great weekend! Tag time and happy mail! Hello everyone and lovely to have you visiting! Welcome to followers old and new. 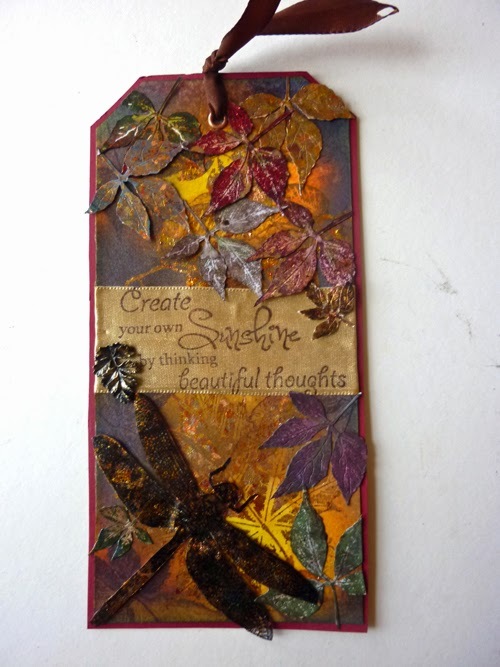 Today I want to share my Tim Holtz November tag. The original can of course be found HERE. I followed Tim's instructions pretty much exactly, so I won't go into how I made it as you can read all about that on Tim's blog. I just used a different colour scheme, as here in Scotland, the Autumn colours have pretty much disappeared, so I kept it more wintery. 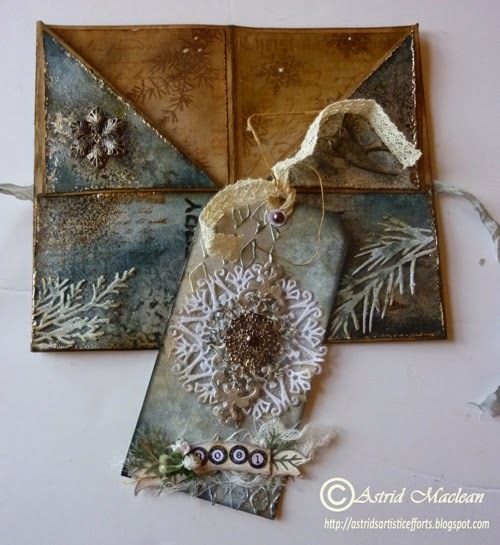 The colours I used were Antique Linen, Pumice Stone and Aged Mahogany, for the background, and Walnut Stain and Brushed Pewter on the corrugated card. 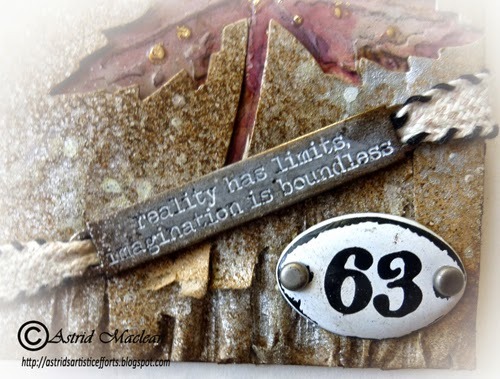 I did not have the embellishments Tim used, so used a word band and enamel number instead. 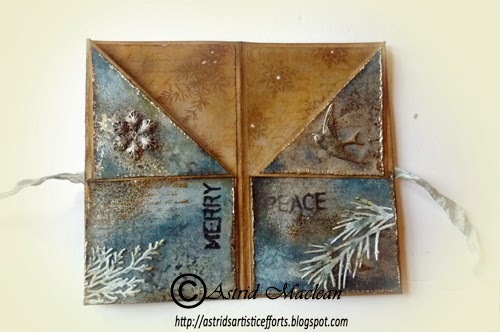 I painted the tag with Snow White Fresco Finish paint and then spritzt with Brushed Pewter, Iced Spruce and Walnut Stain sprays and did a little bit of background stamping too. 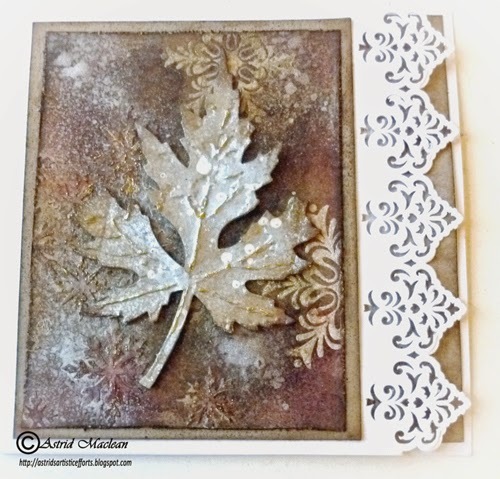 I cut a little tab for the top with the tiny tags and tabs die out of silver Mirri card and then aged it with Brushed Pewter and Walnut Stain sprays. 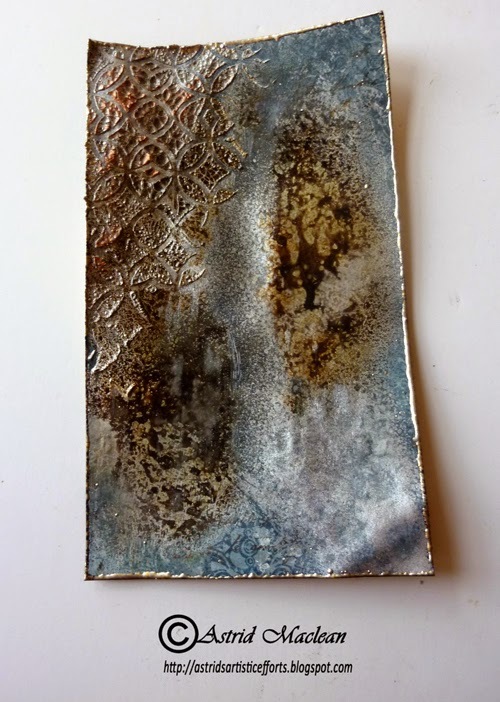 When I heat set it, it started to bubble and gave a cool metal effect, - great new discovery that.. 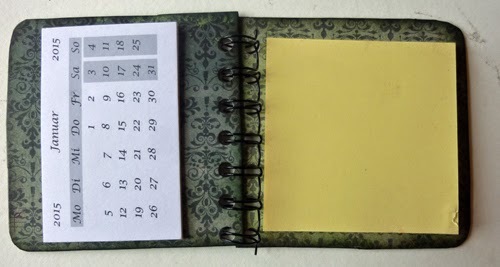 I added the month with the little Tim Holtz letter stickers, sanding them a bit first to distress them, a cool trick I learnt from the wonderful Paula Cheney a while back. I adhered the smaller tag onto the larger one at a slight angle and that was pretty much it. 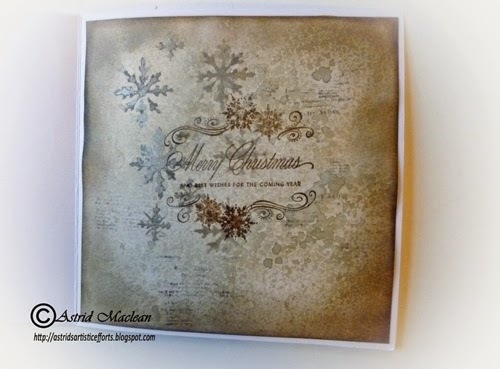 I decorated the inside of my card in a similar way as my previous set of cards, as all the stamps etc were still on my desk. Well, that's it for today. I'll be back on Friday when there is a new challenge over at A Vintage Journey. This stunning tag! 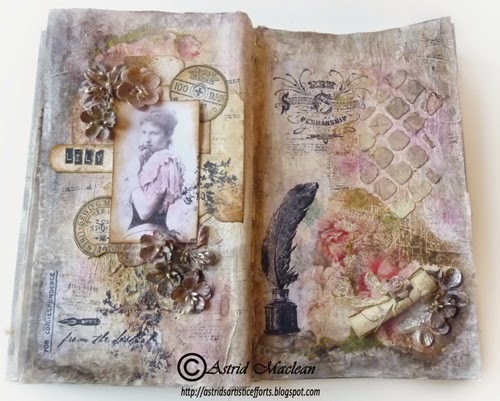 It was a project she posted on the Countryview Challenge blog as she was a winner and I helped her translating the description, it's so stunning! 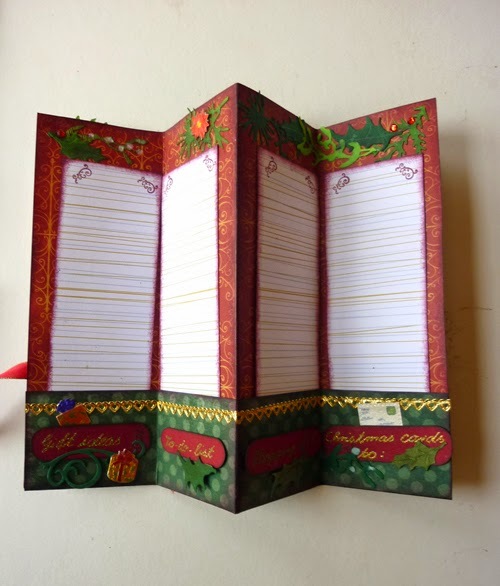 There is a space to keep notes: Gift ideas, To do list, shopping list and Christmas cards. Such a clever and practical idea. Love the mail art style of the covers! Thank you sooooo much Dagmar!!! Well that is it for now. Have a fantastic week everyone!! Hello everyone and a warm welcome, thank you for taking the time to look in here. 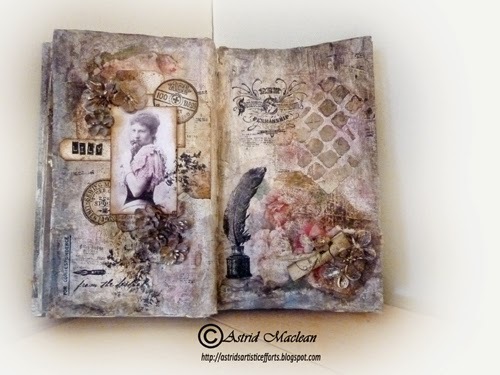 Today I am sharing the next page in my altered book, a page around the beautiful Lily Grace. 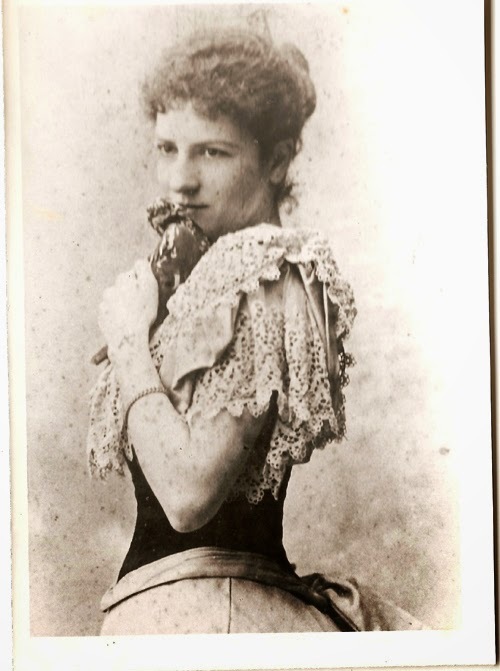 Lily Grace, or Grace as she was known, was my husband's great grandmother, this shows her in 1880. I adore the expression in her face, to me she looks like a real charmer, dreamy and romantic. She would give birth to 5 children 4 girls and a boy. Unfortunately I have no photo of her husband, but I keep hoping he will have looked a little bit like his brother, whose photo you can see here. 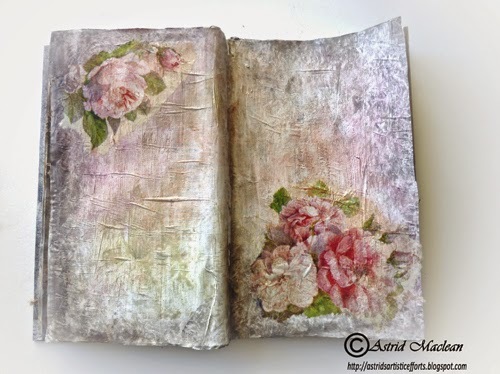 I covered the next double page in my book with some Tim Holtz tissue wrap, followed by a thinish coat of gesso. 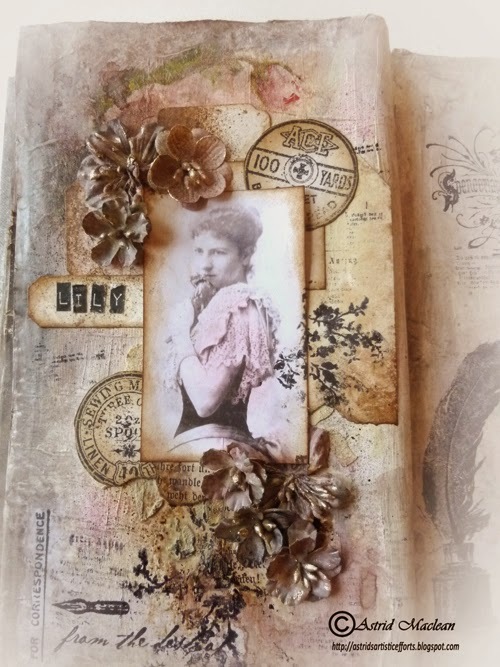 When that had dried I coloured the page with a mix of different acrylic paints (Tim Holtz Antique Linen, Paper Artsy paints in brown tones, both opaque and translucent) I used a brush and both a baby wipe and some kitchen roll to blend them together. I call this the wipe-on-wipe-off method. 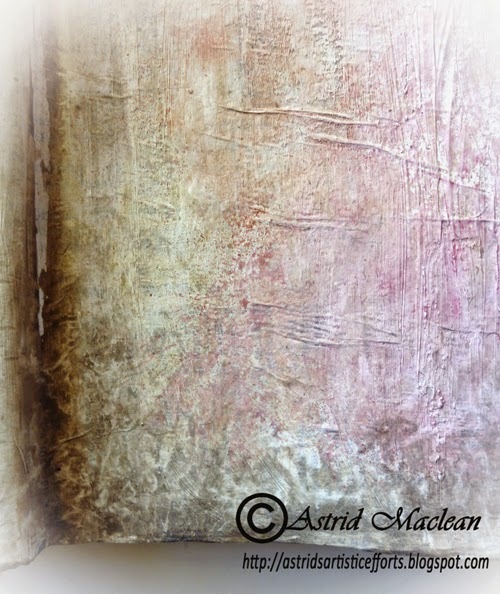 With the gesso underneath you can easily blend and merge the colours as long as they are still wet and with the help of the kitchen roll add additional textures to the paint. 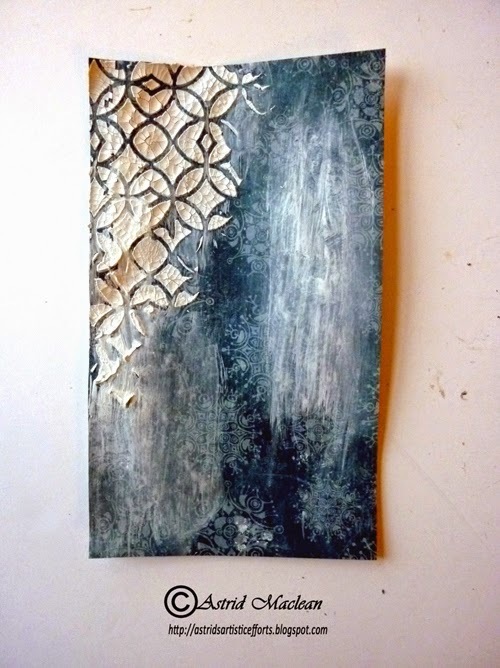 Here you can see the different textures a bit better, achieved through the tooth in the gesso and the kitchen roll bunched together and pounced on the wet paint. 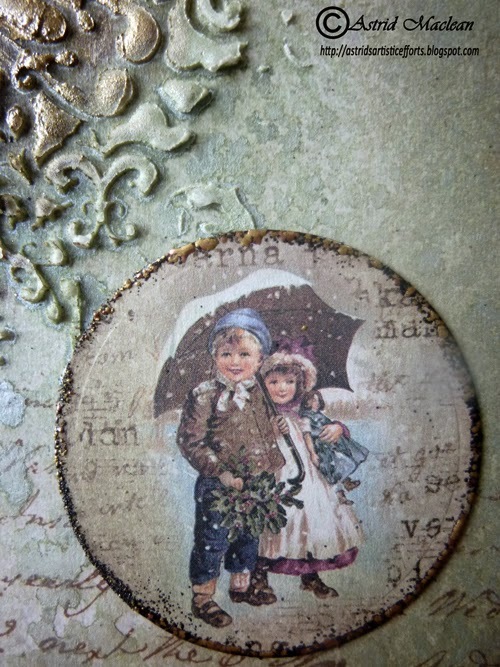 When the paints had dried I sprayed on two colours of Sprays: Lindy's Stampgang Starburst spray in Bodacious Blush (what a name lol) and Tim Holtz Victorian Velvet. 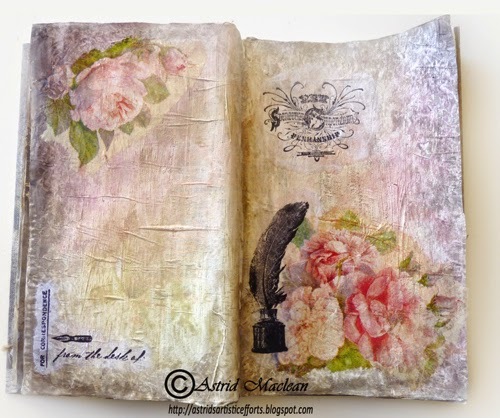 They both have wonderful old vintage pink tones and the star burst just adds a little sparkle. 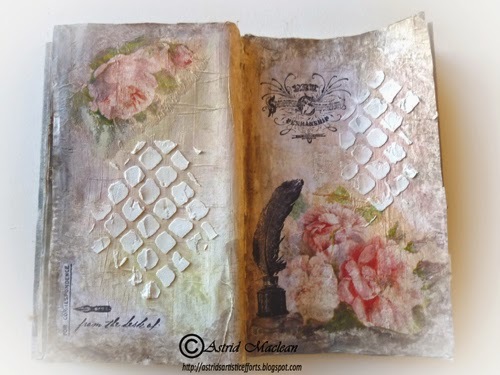 Anyway, because I wanted a really romantic feel to these pages I then added the top layer of a rose tissue, a packet of which that I was lucky enough to find in a stationary shop. I used Ranger Multi Matte Medium for this, my absolute favourite of the moment, because it really dries totally matte and has the perfect consistency. 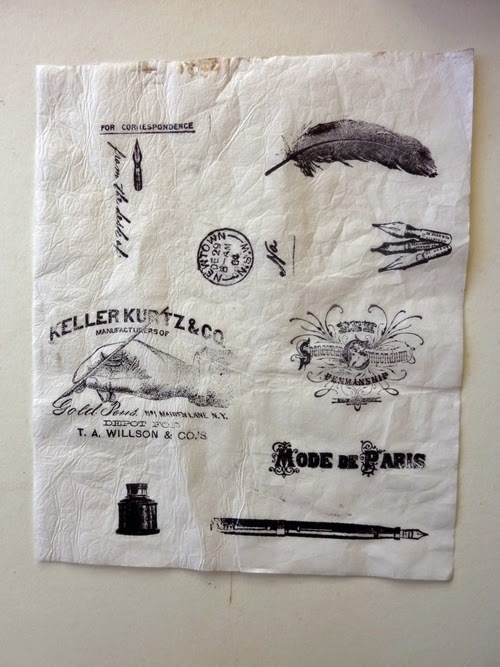 I had this notion of Lily Grace writing romantic love letters so I stamped a number of vintage writing stamps on some tissue paper. 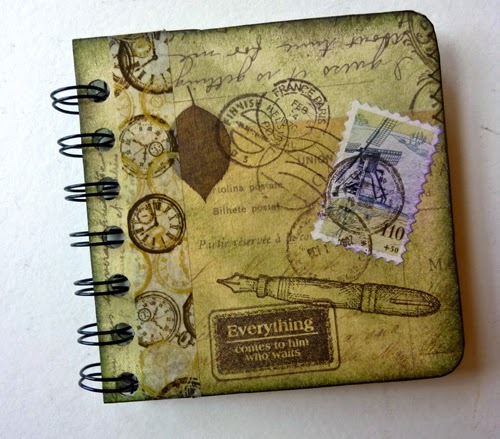 I stamped quite a few, just to have a choice and then selected just three to adhere to my page, tearing around the edges to avoid hard lines. 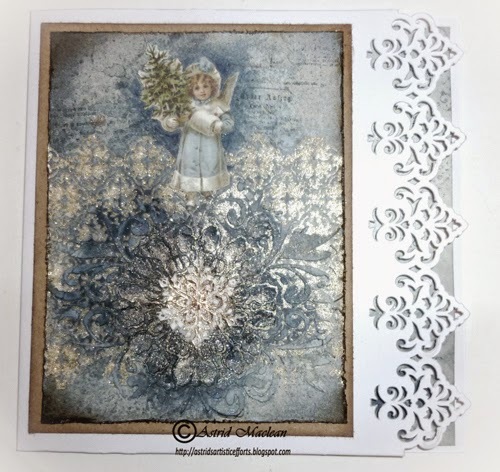 I mounted the photo of Lily on to some tags and other stamped elements and embellished with some flowers, sprayed with a mix of glimmer sprays. 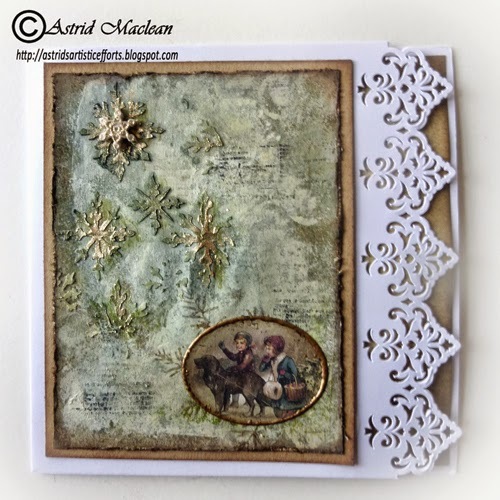 I also did some more background stamping with a little Prima stamp and added her name with the little Tim Holtz letter stickers. 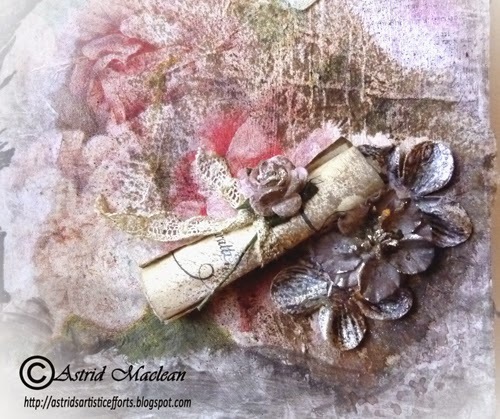 Sticking with the love letter theme, I rolled up a bit of old book paper, tied it with some vintage lace, tucked in a little flower and added some other flowers underneath. Everything was adhered with the Ranger medium. Sorry this post got a bit long, but for those of you who asked, I hope it has given you some idea of how I put it together. 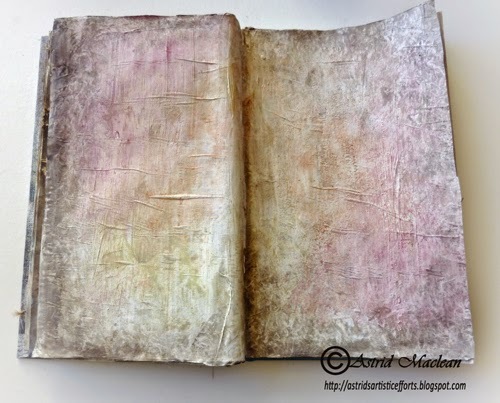 Hope you are having a good week and that you will find some time to be creative! These are not all that dis similar to some earlier ones I did, but on a slightly larger format. 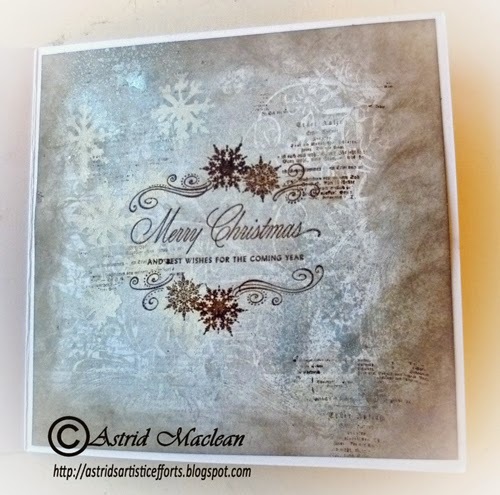 The background was done with a Trimcraft paper line I found in the Range of all places, it's called Gilded Winter and has some stunning papers in it. 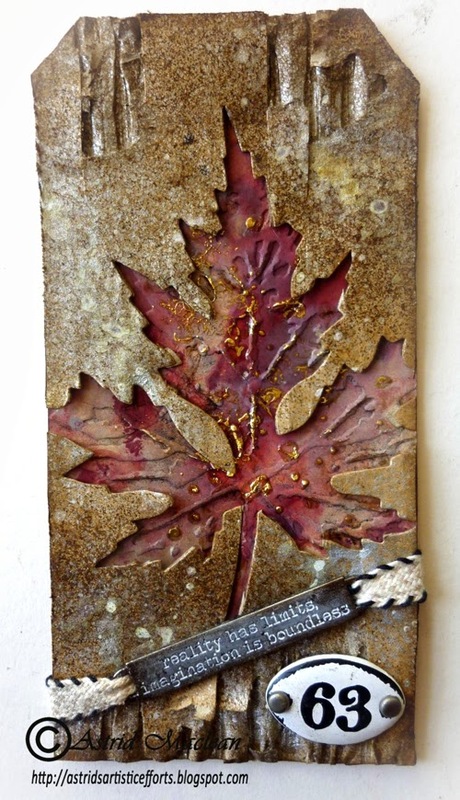 But of course I could not leave them as they are so played around with texture paste and various sprays. 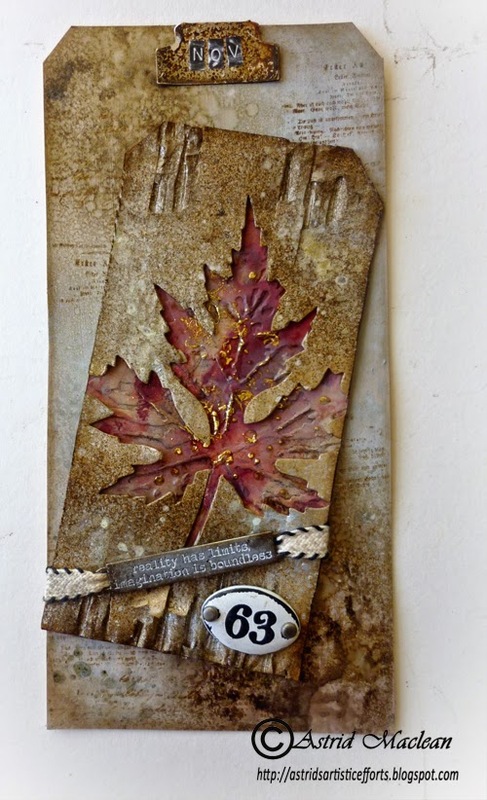 For this one I used the Lathenay stencil from Memory Box, a Lindy's Stampgang Spray, as well as Bundled Sage and Walnut Stain Distress Sprays. 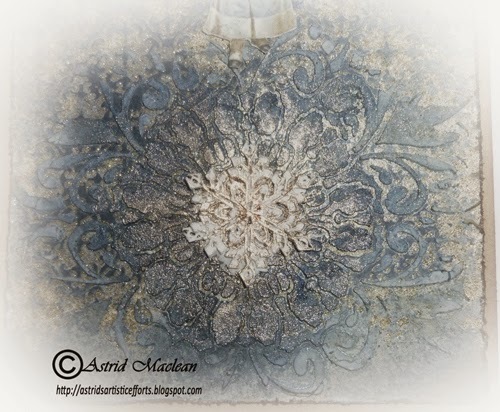 Raised bits were dry brushed with Decoart Dazzling Metallic Luminous Gold, and Treasure Gold in White Fire. 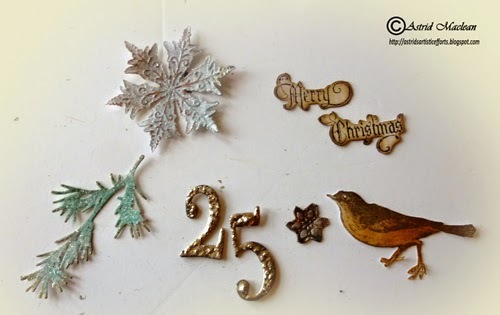 The little snowflake in the centre is paper clay, I made it with a sugar craft mold. 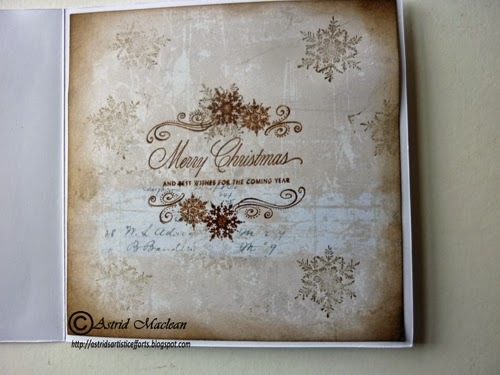 I did some background stamping to add a bit more interest to the background still, the little vintage image is from Maja Design Winter Frost basics. 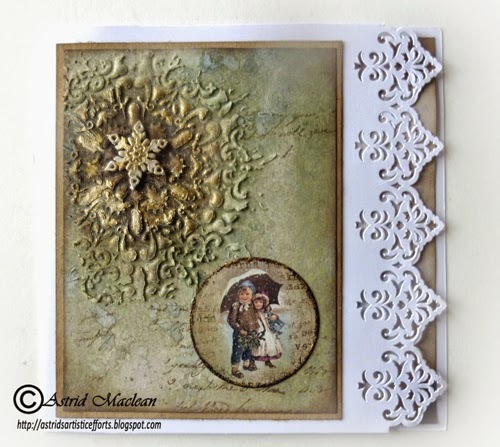 The wonderful sentiment stamp is from Stampendous, the snowflakes are Tim Holtz. 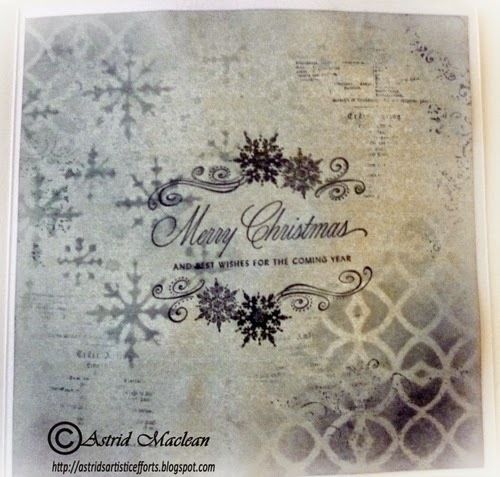 This one uses a Dyan Reaverly stencil and another image from the Maja design papers. 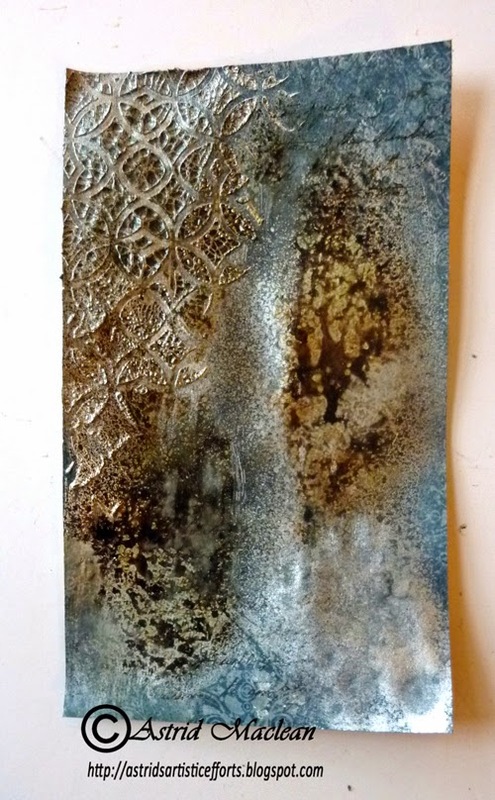 The inside is similar too, - I have so many cards to make, I quite like doing them in a series. This photo is terrible, it gets dark here so early, I had to take it with flash, - it is so much nicer in real life. Thank you for visiting like always and have a fantastic weekend.